The Model 643 electromagnet power supply is a linear, bipolar current source providing true 4-quadrant output, eliminating the need for external switching or operator intervention to reverse current polarity. The Model 643 is capable of supplying ±70 A/±35 V to a nominal 0.5 W, 0.5 H load, and the output can be modulated from an external source to frequencies up to 0.17 Hz at ±70 A. Internally programmed output provides 20-bit resolution, while externally programmed output provides unlimited resolution. 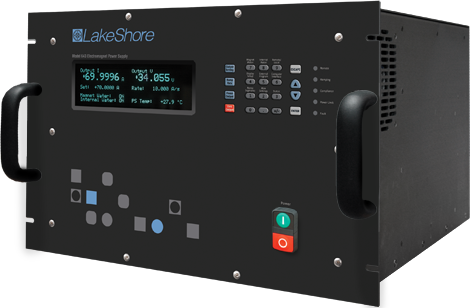 Please contact Lake Shore if you are interested in a Model 643.